Today's Inspiration: Bob Peak: "a mixture of idealism and solid practicality"
Bob Peak: "a mixture of idealism and solid practicality"
Dori Watson, writing in a September 1962 article in American Artist magazine, speaks about "the thorny problem of the dichotomy between fine art and commercial art [being] unsettling to practicing artists, as well as to the consumer and the art-collecting public." Based on some of the discussions in the comment sections of this blog I would say very little has changed in half a century. But back in 1962 there was no self-doubt or confusion on that issue in the mind of the subject of Watson's article. 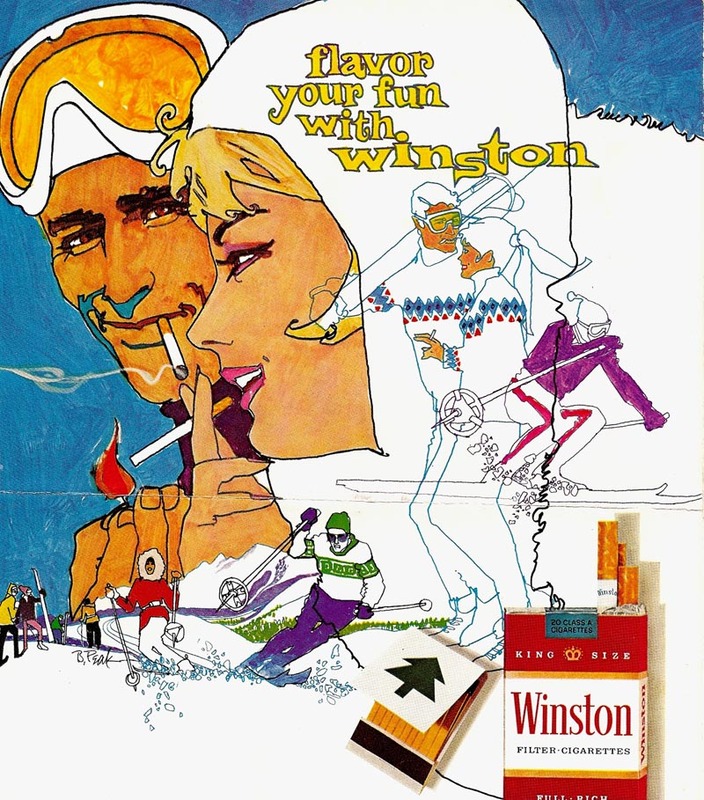 Bob Peak was entirely comfortable with his role: during a four hour interview in his agent's office Peak told Watson "I want to be an advertising man." "I know that in my own work, the things I do for advertising are not the same as those I would do for a gallery show. I do what I do by choice." "I believe in esthetics; I love to paint, to experiment, but I feel I have to be in advertising and have a problem to solve. I don't believe in art for art's sake. I could not be a 'closet painter.' To do this is to go off without first considering the problem." "The most important aspect of the problem is to keep close to those with whom you are communicating." * Many thanks to Charlie Allen for supplying all of today's scans. They are "more clips from the venerable old file," and their arrival was the catalyst for this week's series on Bob Peak. Leif, I think Peak showed good instincts in that interview when he said he wanted to do advertising work rather than "art for art's sake"-- the closer he got to "fine art" prints later in his career, the worse he got. His unapologetic commercial work was the apogee of his career, in my opinion. Just fabulous. Agreed, David -- As I've come to see more of Bob Peak's early work I find myself less and less impressed with his famous movie poster period. 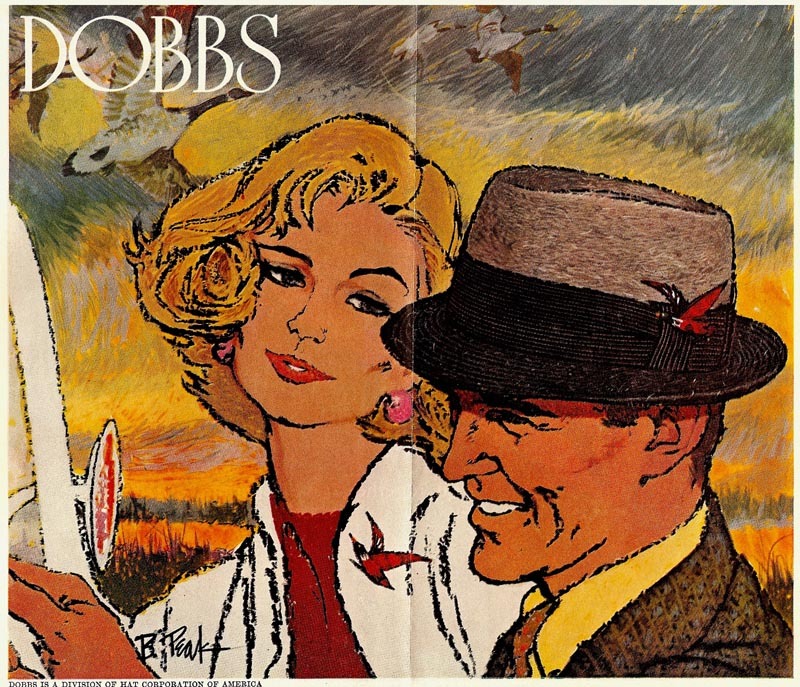 And I find the young Bob Peak's attitude about advertising illustration very refreshing... and very much in line with how Al Dorne expressed his own philosophy about his work. They seem to both have been unabashedly commercial artists. Bob Peak was a young dynamic illustrator wanting to get into advertising when it was at the absolute peak of its Madmen-esque glamor. And earn fortunes in the process.As they say, it's a no-brainer.Short of being a movie star what could have been a more attractive career option? CHAD.....I'm not so sure about those 'fortunes'. The best eastern illustrators did well....a few very well....i.e. Jon Whitcomb. But I go way back to Rockwell and Leyendecker days....don't think fortunes quite fits. Same with Robt. Fawcett. Very comfortable ( Actually he 'bitched' and complained all the way! ), but not a fortune. David....right on. 'Just fabulous'. I saw a few originals.....I believe just humble Del Monte ads.....and you could tell he thoroughly enjoyed his work. Same with Fuchs. Saw some pencil comps he did for Gallo....full of quality and enthusiasm. As said, I enjoyed advertising....ups and downs on assignments....but always interesting and a challenge. In theatre I've heard the saying 'there are no small parts....just small actors'. Maybe the same with illustrators. I agree with Peak's attitude about being an illustrator vs. a fine artist. Certainly a different take than Robert Weaver had. Even Burt Silverman was reluctant to call himself an illustrator when he was doing commissions for Time Mag covers and editorial assignments. But, I think disposition, ego and acquired attitudes play into that, and I suspect that varies with each illustrator. 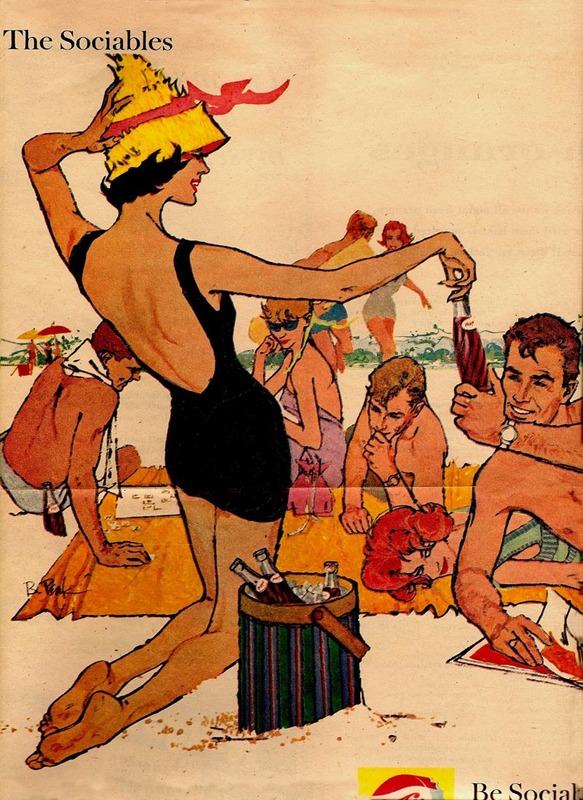 Some illustrators felt that editorial work was a higher standard of illustration than advertising. Howard Pyle and Dean Cornwell felt that doing murals was the highest form of illustration, because of its grandiose size, and more people would see it over a longer period of time. I don't know for sure how much Peak was making, but the rumor was that he made over a half a million in one year, in the 1970's. For a few, that may not have been a big deal, but for most, that would have been a very large income.. even if it were half that amount. Anyway, Peak was probably making as much or more than the top illustrators at the time. I also heard that making the big bucks were important to him. I couldn't imagine Peak being happy trying to scratch out a living from galleries and prints as a fine artist, and after reading his quotes, it makes sense to me. 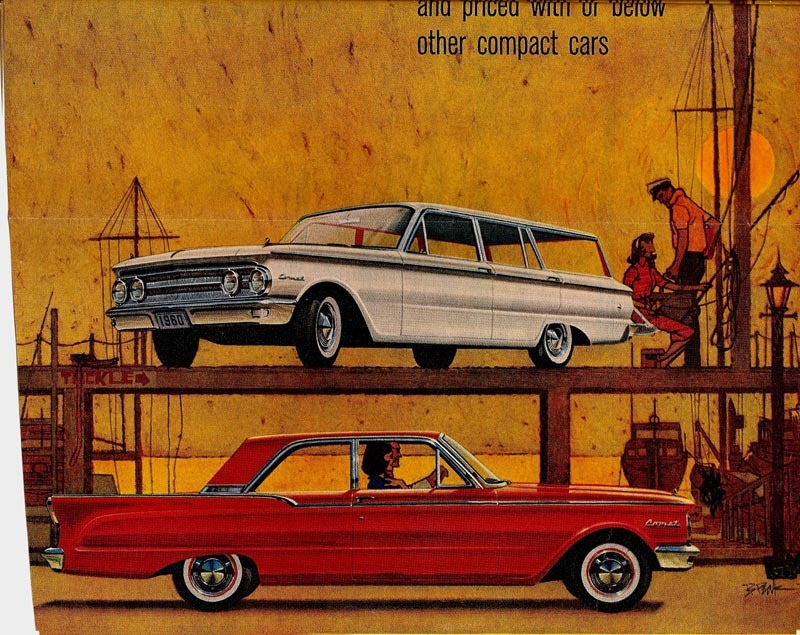 The thing is, Chad, being a young dynamic illustrator and wanting to get into advertising do not necessarily go hand-in-hand. I've seen that throughout my career, read it so often all over the blogs of other artists and very regularly here in the comments section of TI. I would not say its a "no brainer" - not by a long shot. As Tom pointed out in his comment, many illustrators struggle with their role as commercial artists - they even kid themselves that doing editorial is somehow akin to being a fine artist - or perhaps the best of both worlds: freedom of artistic expression and a commercial artist's paycheque. As you'll read today, Peak (again, refreshingly, imo) splashes cold water in the face of that notion. Yeah i see that and what i think is great about Peak was that he had a conception of glamor and must have thought that advertising was the best application of that idea.In essence he must have been more attracted to that than the editorial millieu.And in doing so I think he created thrilling colrful work,it's certainly my favorite Peak stuff. Bob Peak's quotation: "I believe in esthetics; I love to paint, to experiment, but I feel I have to be in advertising and have a problem to solve'. For me, this says it all. I understand this notion. 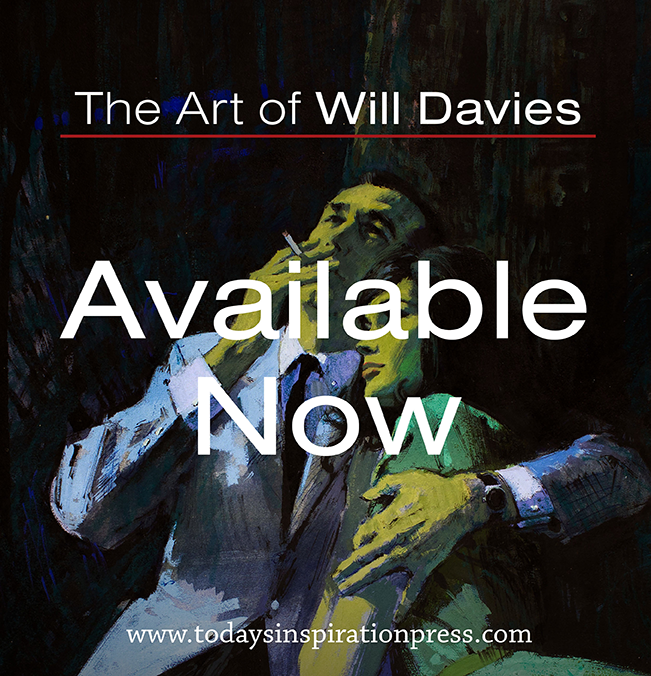 It is the defining factor for many illustrators who try to make the transition into fine art or straddle the fence between the two. Like Peak, the challenge for me was always the problem solving aspect, and not just paint an attractive, well done picture to be sold and hung on the wall, as part of the interior design of a home, office, hospital, municipal building, etc., etc. I enjoyed doing, and still do easel paintings for pleasure and for sale, but applying ones skills and knowledge as an artist in solving advertising assignments, was far more rewarding for me in many ways. But, I knew I wanted to be an illustrator years before I was a teenager. The Saturday Evening Post, True and Argosy magazines was like an art gallery for me, when I was a kid. I never considered jut painting pictures to sell to the general public. That's great for those that prefer to do that. Unlike many people I know, I don't have a problem with those like Thomas Kinkade, who has become extremely successful in the fine art market. For 40 years, llustration gave me variety, and I rarely found it boring or repetitious.